The Big-12 and ACC have received hype all year as the best conferences, but the Big Ten is no slouch. Boasting No. 2 Purdue, No. 3 Michigan State, No. 3 Michigan, and No. 5 Ohio State, plenty of bracketologists will have one or more of these squads making a deep run. However when breaking down each team’s path to the Elite Eight, it appears none of the aforementioned teams will have an easy road. Purdue would appear to have the best shot as a No. 2 seed — though getting by Butler or Arkansas will be no easy task. Defensive-minded Texas Tech could also pose a tough match-up, and blue-bloods Florida and UCLA could play a part in knocking out the Boilermakers. The Wolverines will feel the effects of their prolonged rest. Not playing for anything of consequence for nearly two weeks can absolutely hinder a team’s psyche. Ohio State might have problems getting out of the Round of 64 with Mike Daum and South Dakota State in their way. If the Buckeyes win, they’d likely play Gonzaga (whom they already lost to by 30 earlier this season). Michigan State is the most dangerous threat to make the Final Four. With that said, the Spartans are poised for a Sweet Sixteen match-up with Duke. I like the Blue Devils in this hypothetical contest. The Big-12 has an impressive total of seven teams who reached the Big Dance, but they won’t be there for long. Texas Tech (3), West Virginia (5), Kansas State (9), TCU (6), Oklahoma (10) and Texas (10) will all fail to win more than one game. Texas Tech and West Virginia rely heavily on their defense. Both teams force turnovers and employ a chaotic style. They prey on shaky ball handlers and inexperience. Smaller schools (such as Murray State and Stephen F. Austin) don’t have the privilege of filling their team up with 5-star freshmen each passing year. As such, Murray State and Stephen F. Austin are filled with heady upperclassmen that won’t be rattled by the Big 12 aggression. TCU pulled the short straw, and will be facing the winner of Arizona State and Syracuse. The Sun Devils are an explosive offensive team with quick guards. The Orange pose a tricky match-up due to their zone defense. Both teams are incredibly tough to prepare for on two days’ notice. Oklahoma and Texas, simply put, are facing off against better teams in the Round of 64. Rhode Island is far more balanced then Oklahoma, and has the guard play to make Trae Young work on both ends. Nevada is a 27-win team that was knocked down a spot or two due to a poor performance in the Mountain West title game. It shouldn’t come as a surprise when the Sooners and Longhorns are sent home early. The 2018 field of play-in teams are unlike many we’ve seen in the past. 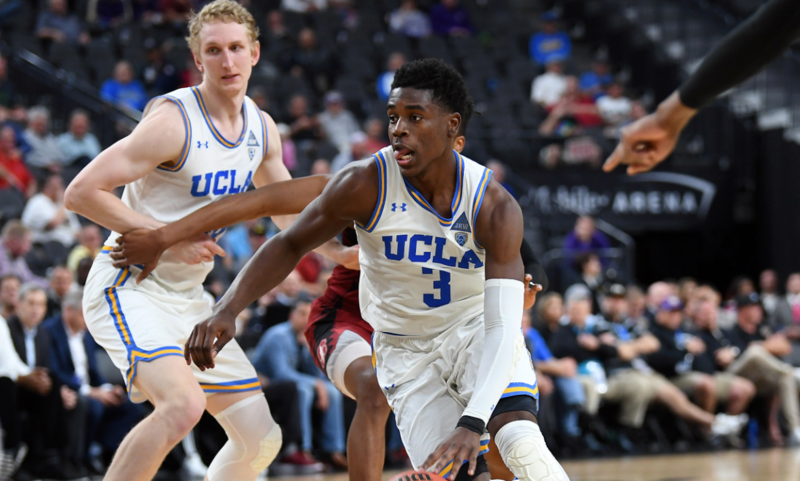 A talented UCLA team includes potential first-round draft picks Aaron Holiday and Kris Wilkes. St. Bonaventure features two elite senior guards that can fill it up in Jaylen Adams and Matt Mobley. Jim Boeheim and Syracuse are no stranger to making deep runs in the NCAA Tournament as a double-digit seed. Since the field was expanded to 68 teams, at least one team from the “First Four” has gone on to win at least one game in the Round of 64 every year. USC did it last year when they beat SMU, and VCU famously made it all the way to the Final Four after beating USC in the inaugural First Four round. The play-in games have given the winners a bit of steam as they enter the field, and one of these four teams will capitalize by making it all way to the second weekend. The talent gap across the nation is as small as ever. Teams that were formerly ranked in the top-10 in the nation are now No. 5 and No. 6 seeds. Perennial programs are fighting for their lives in the play-in rounds. Games will be highly competitive in each round, and the quartet of No. 1 seeds will need to be on their game from the onset. I’m not going as far as saying a 1-seed will go down to a 16-seed (although Penn is probably better than their seeding), but the Round of 32 could pose a threat for Virginia, Villanova, Kansas, and Xavier. The eight and nine spots are filled with scary match-ups — including offensively gifted Virginia Tech, gritty Creighton, experienced Seton Hall, and the likes of future lottery picks Collin Sexton and Michael Porter Jr.
At least one of the No. 1’s is going down early. Since 2000, just four players have recorded a single 40-point game in tournament play. A fifth name will be added to that list this year. This field is filled with offensive stars that can light up the scoreboard in a moment’s notice. All-Conference upperclassmen Grayson Allen, Allonzo Trier, Trevon Bluiett, Devonte’ Graham, and Aaron Holiday are in the hunt for one last memorable performance representing their respective schools. Freshman studs Trae Young, Collin Sexton, Marvin Bagley III, DeAndre Ayton, and Michael Porter Jr. can all fill it up (especially with the hopes of boosting their respective NBA Draft stocks.) Even the lesser known talents — South Dakota State’s Mike Daum, Marshall’s Jon Elmore, Davidson’s Peyton Aldridge, and Murray State’s Jonathan Stark — are looking to make themselves household names. Reaching the 40-point mark isn’t just an individual achievement, either. Big scoring outputs have led to success in the tournament. Teams with a 40-point scorer have won 40 of their last 50 games. Somebody will get hot, and lead their team to a victory in the process. Despite the idea that the NCAA Tournament is centered around the “underdog story”, the usual suspects typically fill out the later rounds of the brackets. North Carolina, Kentucky, Michigan State, and Kansas almost always make deep runs as the Cinderella teams fade after one or two emotional victories. This year will be different. The field is truly wide open — allowing a slew of Mid-Majors to claim their spot in the Elite Eight. Between Xavier, Villanova, Cincinnati, Gonzaga, Wichita State, Houston and Butler, at least four Non-Power 5 teams will fight for a spot in San Antonio. After a crushing defeat last year, Gonzaga will be looking for redemption in Los Angeles. Their biggest worry is Xavier — who they might not even end up playing if Michael Porter Jr. and Mizzou have anything to say about it. North Carolina will play a Michigan team that they already thumped by 15 points earlier this year. They’re too big and too experienced to drop a game earlier than the Elite Eight. 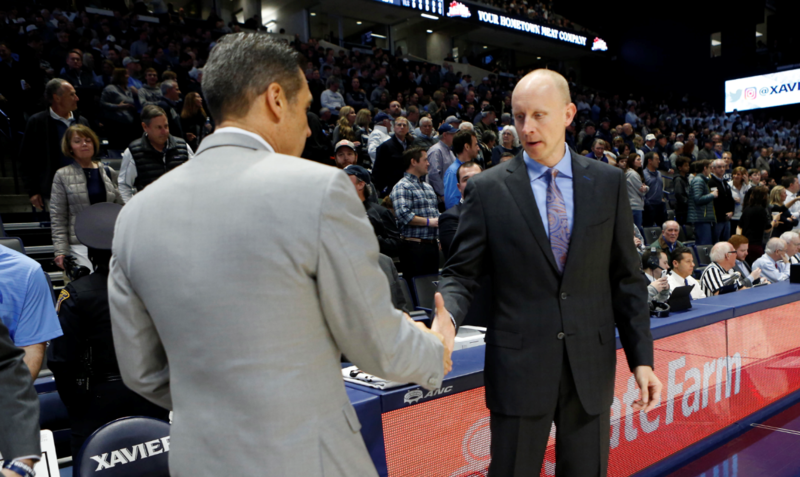 As a result, the ‘Zags and the Tar Heels are on a collision course to meet once again in the NCAA Tournament. Not since 1988 have we seen two teams from the same conference battle it out in the title game. It was a Big Eight battle between Larry Brown and the Kansas Jayhawks against a Mookie Blaylock-led Oklahoma team. On the 30th anniversary, this time we’ll be getting an All-ACC Final. Virginia has been battling with Villanova for the title of best team in college basketball all year long. The Cavaliers have a historically great defense, and have made a giant leap on the other end. Duke has a star-studded starting lineup, and have looked downright unstoppable in spurts this year (see the Michigan State game without Bagley). The best conference in the nation will prove itself, yet again. 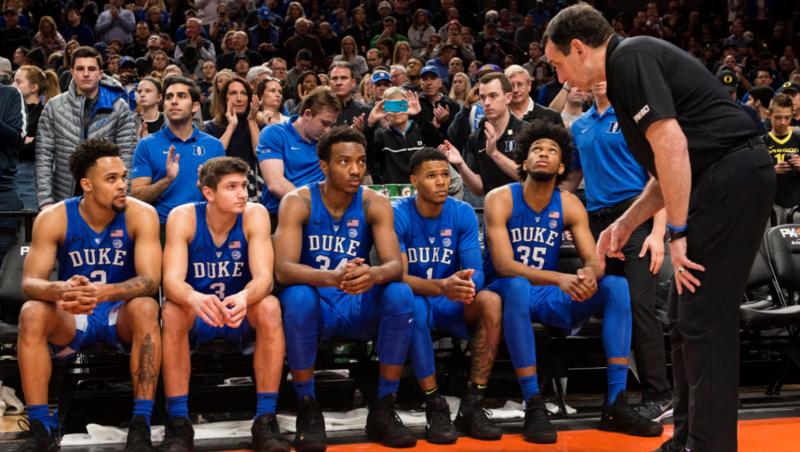 The Blue Devils remain the most talented team in the nation, and enjoy the extra caveat of having the most successful coach in college basketball history patrolling their sideline. Allen has been here before — he was just a freshman when he poured in 16 points against Wisconsin in the 2015 title game. He doesn’t shy away from the big moment, and possesses the bravado and skill-set to flourish under the bright lights. 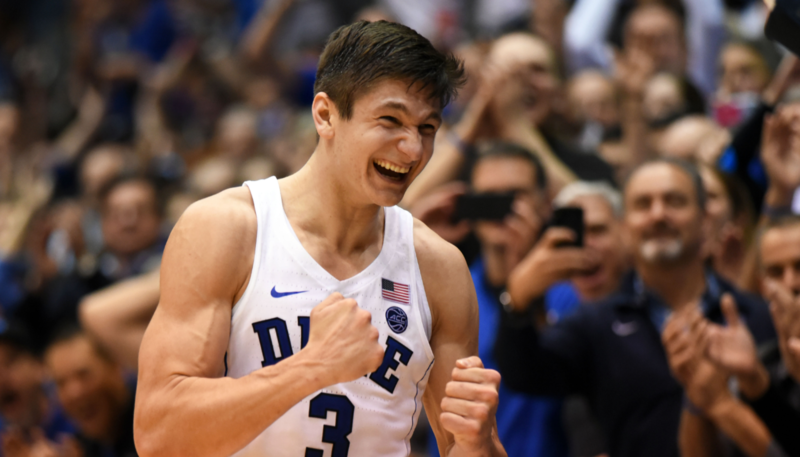 With teams focusing on freshmen Marvin Bagley III and Wendell Carter, Allen will put his sharpshooting and ferocious slashing to use while leading the Blue Devils to their sixth National Championship.